Rebtel is one of our most favorite VoIP services because of their cheap rates and excellent quality. As Rebtel gets bigger, customers are demanding more features such as a PC application for making calls. Rebtel offers local numbers which users can use to dial. Prior to this, people in other parts of the world such as India could not make calls via Rebtel. Now they also can using the PC software. This can application can be used from any part of the world and the only requirements are the PC application and a Rebtel account. The application is exactly like a phone on your computer so you can call make cheap calls worldwide from the comforts of your home and computer. 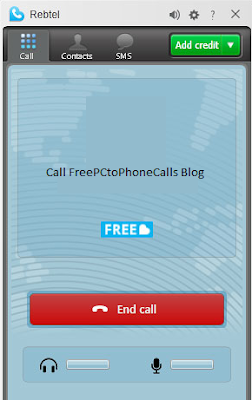 You can also make free calls to other Rebtel users who have the phone installed on their computer. This feature is somewhat unnecessary because of services like Skype. This blog has a special coupon for its readers. You can get a 100% bonus which means if you add $10.00 then you will receive $20.00. Not a bad deal! You can check out the offer at: Rebtel 100% Bonus. How many phones do you have? What is your buying time frame? What is your data connection? You are requesting a quote and other information regarding your telecommunications needs. I agree to receive quotes,newsletters and other information from cheapestvoipcalls.net and its partners regarding telecommunicaton services and products. I understand that I can withdraw my consent at anytime.